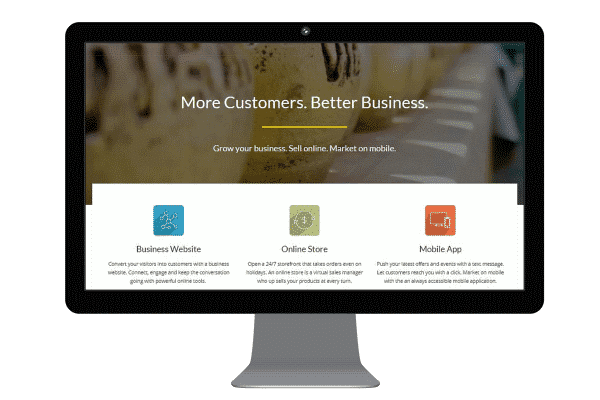 Grow your business with a feature-rich, conversion focused business website. Core business and convenience features are built into each of our business websites. Absolutely FREE. Get a feature rich business website in as fast as 3 weeks! Be ready for business. It even comes with a branded landing page for your campaign. Engage your visitors. Connect with clients. Get more tools and features to promote your business at $100 per feature. It takes several interactions before a customer makes the decision to purchase. So keep that conversation going! Launch surveys and contests, publish a newsletter and offer online ordering with a business website. Choose from several front end forms to engage your visitors, connect with your customers and build relationships. Get the tools you need for the most important elements of digital marketing with a business website. Reach new customers. Make your brand visible. Maximize revenue generating opportunities. Your business website can be as dynamic as your business! Enjoy the ultimate convenience of keeping your promotions, events, portfolio or any other content up to date with an easy post template. Each easy post template is a standard feature which can be added to your business website for $100. A business website does so much more than what you may think. The sky is the limit. Choose from several advanced features. Get customized solutions for your business, starting at $200. Ask now and be amazed! If you don't see what you need, just let us know. We're always happy to help you find the best solution for your business needs! Accept online booking, reservations and take appointments. Conversion focused web design makes it easy for your customers and grows your business! Beautifully display and filter your real estate listings. Integrate your property directory. Present each listing as a full page for your customer's convenience. Is your market international? Enjoy the benefits of a multilingual business website and engage your customers in their native language. Offer resources, forums, downloads, videos, support and more with a membership site. Manage and customize with admin controls. Manage free or paid classified ads. Set duration and expiration. Accept payments. Create a job network or a marketplace. Get a brochure website for as low as $550 (Php 25,000). Start with the basics of conversion focused web design and build from there. Our starter package is the best way to be ready for growth. SAVE THE TREES. BUILD A WEBSITE. Flyers, brochures and other print media eventually end up in the bin. With a business website, you reach more customers without reducing our oxygen source.